Recently, Microsoft in its newest test build release of the Windows 10 showcased the new improvements to be officially released in the current year. 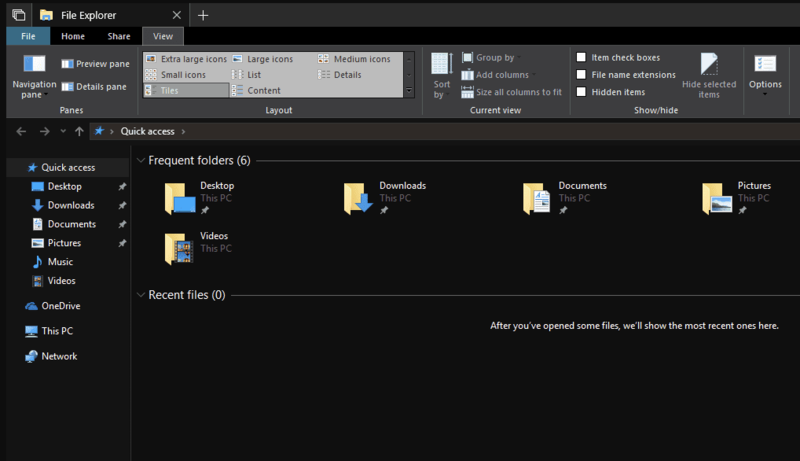 Amongst various other additions, Microsoft also showcased a dark theme for their file explorer. The company doesn’t have a full version of the dark theme at the current point of time but it teased how the file explorer would look if the ‘dark mode’ was implemented. For many people for whom, the new ‘dark mode’ feature is a boon. This is because it gives them ease while working in the dark by reducing the strain on their eyes. Additionally, it can also be combined with the Windows 10 pre-loaded night-light option which is greatly helpful for users working in the dark. There are users who often need to switch between their hand-held devices and their computer or laptop. While doing so, they often need to copy and paste data from one device to the other. This often becomes hectic, as they need to plug their devices into the computer. To eliminate this hassle, Microsoft in its new update introduced the Cloud Clipboard. The Cloud Clipboard lets users access their copied clipboard content across multiple devices. The clipboard in its newest update contains a history that keeps a track of all that has been copied. The clipboard then synchronizes the copied content in a similar way like the Sets and Timeline sync. This helps the users to get the copied content on other devices. The released build also showcased a few subtle changes in the design. The operating system in its newest release contains an acrylic title bar. While multitasking, the Alt-Tab switcher keys also include recent Microsoft Edge tabs. However, if people find this feature exasperating, they can choose to disable it under the Settings menu. Apart from this, Windows 10 also allows the users to greater flexibility while opening applications or websites. If needed, users can adjust their Sets preference to “Window”. This prevents any further windows from being opened into a new tab unless users explicitly click the + or use the “Tab” button. The final major update brought by Microsoft was the Notepad. The company integrated the Bing search with the Notepad, which helps users to highlight words and search them right-away from the Notepad. Apart from this, users can also have results opened on a new page instead of a separate window by enabling the Sets. The newest build version promises various features which are advantageous to multiple users. The Cloud Clipboard and the upgrades in Notepad are certain features which will make many users upgrade their operating system. In case, users feel like making use of these features, they can sign up to the Insiders program of Microsoft and request for their copy of the Windows 10 build 17666. For other Windows users, the update will start rolling out later in the year.